In the middle of our Warrior Wives prayer group, I got a text from my son. He said his Dad got hurt playing basketball. After a few texts back and forth, I realized it might be a bigger problem than I originally thought and made it home just after them. The next morning I took Shawn to the doctor to get his knee checked out. An x-ray showed no broken bones, but he was told if the pain didn’t get better after some time, he needed to see his regular doctor in case he had torn his ACL. 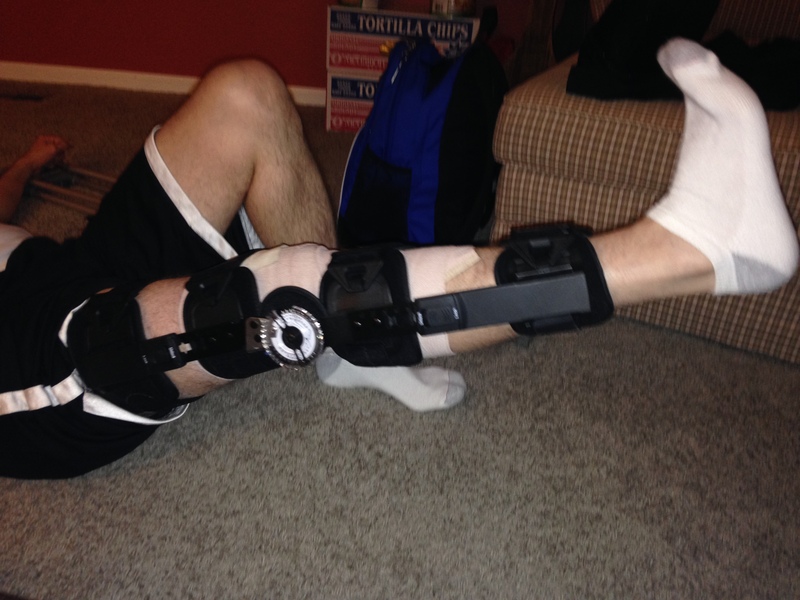 Fast-forward a couple of months, an appointment with an orthopedic surgeon determined he had torn either his ACL or his meniscus. Turns out it was both, and he had surgery Friday. The surgery went very well – no problems, Thank You Lord. And he was his usual, charming, sarcastic self before and after the surgery. The recovery is not going nearly as quickly as he had hoped (he had wanted to be back at work by Monday… It’s Thursday and there is no real return-time in sight). And I think it must be a little frustrating for him to need help occasionally. He never needs help, and is usually the one giving help. To be the one on the receiving end is a big change. If I’m being honest though, I am enjoying getting to do things for him. It’s good to be needed. He needs me to fix his breakfast, he needs me to carry things for him, and he needs me to reach things he can’t. He needs me to stand behind him as he climbs our steps to get on the porch so he doesn’t fall over, or do a dance across our yard in an attempt to balance himself like he may or may not have done yesterday, and I may or may not have laughed hysterically (though he won’t admit that he needs me for this). He also needs me to drive him to his physical therapy appointment. Those are things I can do, and I love doing for him. This is how I am supporting him through this. But there are some things I can’t do. I can’t fix his leg muscles – his surgeon and his physical therapist have that responsibility. But I can do my part. I was reading a couple of verses in Galations chapter 6 today, and verse 2 jumped out at me. Similar to how I was helping Shawn, Paul is telling the church to support each other. It’s kind of a no-brainer that we are to be there, helping people as they need it. When people are down, we are to encourage them. When they are sick, we bring them a meal or send a card.Though there are times I have great intentions for about 3 minutes, and then I’m all “Squirrel” and forget to follow through until the opportunity has been missed. My intentions are right in line with Jesus, it’s my follow-through that needs serious work. But there are other times it is harder even to have the good intentions. Like when the problems are complicated, and we don’t know how to respond. If someone is getting a divorce, or has a child with cancer, or a dying parent, or a relapse in drug abuse. How do we help them? Surely someone else is better equipped and qualified to do that job. So we step back and wait for them while we offer a genuine, “If you need anything at all, let us know.” But people don’t usually let me know. They need me to just do it. And there is always something we can do. We might not be able to save someone else’s marriage, but we can leave a cup of coffee and muffin for her just to let her know someone is thinking about her and praying for her. We might not be able to heal a child from cancer or even offer life-changing words to the parents, but we can bring a toy to the hospital. We can offer to bring dinner to the mom and dad. For a friend with a dying parent, we can’t save them, but we can ask them to share a favorite story about their parent, or see if they need their pets fed while they are spending days in the hospital with their loved one. We can’t cure someone’s drug addiction, but we can spend time with them, showing them the love of Jesus. We can’t do all the things, but there are things we can do. We can’t let insecurities birth excuses and keep us from showing the love of Christ and carrying each other’s burdens. We may not be qualified to fix the whole problem, but we can be the support. If I look at a situation like that, I am sure to find something that I can offer. I can’t fix Shawn’s leg, but I can take him to the one who can. I can’t fix everyone’s problems and change them myself, but I can support them and point them to the One who can. And it’s my job – Paul said so. So today when you see a situation that someone needs help with, look at it with fresh eyes, and ask yourself, “What is the part that I can do?” Then lets do it. Oh, and Ignore the squirrel.